The Institute for Bioengineering of Catalonia (IBEC) is a leading-edge multidisciplinary research centre based in Barcelona that conducts excellent interdisciplinary research at the frontiers of engineering and life sciences in order to generate new knowledge by putting together fields like nanomedicine, biophysics, biotechnology, tissue engineering and the applications of health information technology. IBEC is a non-profit-making foundation set up in 2005 by the Departments of Innovation, Universities and Enterprise and Health of the Government of Catalonia, the University of Barcelona and the Technical University of Catalonia. It conducts interdisciplinary research at the highest international level, creating knowledge that helps to enhance quality of life, improve health and create wealth. IBEC aims to cement a solid international position in the field of nanomedicine and bioengineering. It is currently located in Barcelona Science Park, has facilities covering 2,500 square metres of floor space, 20 research groups and a team of researchers and support services made up of almost 300 people from more than 31 different countries. This location in Barcelona Science Park offers a highly stimulating biomedical environment where the institute can work in close cooperation with both public and private sector organisations. IBEC is one of the top research institutions labelled as a Severo Ochoa Research Centre by the Spanish Ministry of Economy and Competitiveness (in charge of research and innovation policies), which recognizes excellence at the highest international level in terms of research, training, human resources, outreach and technology transfer. The Severo Ochoa award provides 4M€ for the 2015-2019 period to implement IBEC’s Research and Human Resources Programmes. IBEC’s working environment is lively and dynamic, with a calendar through the year of social and networking activities such as soccer and volleyball leagues, participation in the Women’s Race, Bowling, etc). In addition, IBEC disseminates to all members different social and cultural activities organised by partner organisations, such as Barcelona Centre Universitari (BCU) and Barcelona Global citizen’s platform. 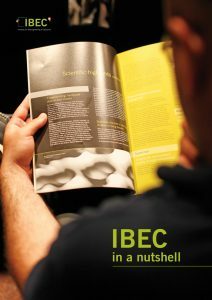 Download IBEC’s in a nutshell pamphlet here.